It’s a myth that if you plan to gel coat over a repair, you must make the repair with polyester. We’ve used gel coat over epoxy for decades, shown it in our instructional videos on repairing fiberglass boats, and discussed it in past issues of Epoxyworks. There are three key factors for success with gelcoat over epoxy. First, the epoxy needs to be mixed on ratio. Second, it should be fully cured, and third, the surface should be free of amine blush before applying gelcoat. Gel coat manufacturers shy away from approving the use of non-air inhibited gelcoat over epoxy because they’re concerned amine blush will interfere with the gelcoat’s cure. All that’s required to remove the blush is washing the surface with plain water. The resulting surfaces is ready to be prepared for paint or gelcoat. Release fabric can be used to remove epoxy blush quickly and easily. As the epoxy cures the blush forms on the outside of the release fabric. When the release fabric is removed it takes the blush with it and the resulting surface is ready to be prepared for paint or gelcoat. Epoxy does more than sit on the surface of wood. Some of epoxy will remain on wood surfaces, and some of it will penetrate into the wood. The amount of penetration depends mostly on how the wood fibers are oriented. Face grain will not absorb nearly as much epoxy as end grain. But since WEST SYSTEM Epoxy has very high strength and excellent adhesion, it strengthens the wood and makes it waterproof. In larger quantities, epoxy will cure much faster. This is because epoxy generates heat as it cures and also cures faster at higher temperatures. This snowball effect increases until the epoxy cures—which in very large batches could be as short as a couple of minutes. Large pots of mixed epoxy can generate enough heat to cause a runaway exothermic reaction, smoking, melting the mixing cup or even starting a fire. Spreading epoxy thin allows the heat to dissipate and slows its cure. WEST SYSTEM Epoxy has a very low percentage of shrinkage. In fact, the standards used to calculate shrinkage of other resins (polyester and vinyl ester) cannot be used with WEST SYSTEM because it shrinks so little. When epoxy is used to fill holes drilled into wood, it soaks into the end grain and this can give the appearance of shrinkage. Back in the late ’70s and early ’80s, Gougeon Brothers Inc. manufactured over 4,000 wind turbine blades and their molds using WEST SYSTEM Epoxy. It was commonplace to see a 70-foot long mold shrink 3/32” over the entire 70-foot length. That is shrinkage of .01% on a laminate consisting of fiberglass and WEST SYSTEM Epoxy. When casting epoxy, heat buildup can become an issue. Excessive heat can make WEST SYSTEM Epoxy can shrink some. Pouring epoxy in great depths creates the potential for the epoxy to get very hot due to the exothermic reaction resin and hardener have. The shrinkage that does occur generally happens while the epoxy is still liquid, but when an intense amount of heat is present, epoxy doesn’t stay liquid for very long. As the heat dissipates, the difference in temperature between the top and bottom of the casting can shock the now solid epoxy and it may crack. This can be avoided by making deep castings in layers. While it’s possible to add wood sanding dust to epoxy to change the color and viscosity, it does pose a risk when bonding to an absorbent substrate like end grain. With wood dust, the epoxy isn’t actually gaining viscosity, it is just being absorbed into the wood dust. This leaves it free to drain back out on absorbent surfaces. If you blend sawdust into epoxy to achieve a peanut butter consistency and place the mixture on a dry paper towel, you will notice that the paper towel soaks up a lot of epoxy as it cures. Because the sawdust is not actually thickening the epoxy the way our fillers do, the epoxy runs out of the mixture with ease. Given enough time, the epoxy can drain out of the sawdust and create a glue-starved joint or a puddle. On the left is epoxy mixed with sanding dust. 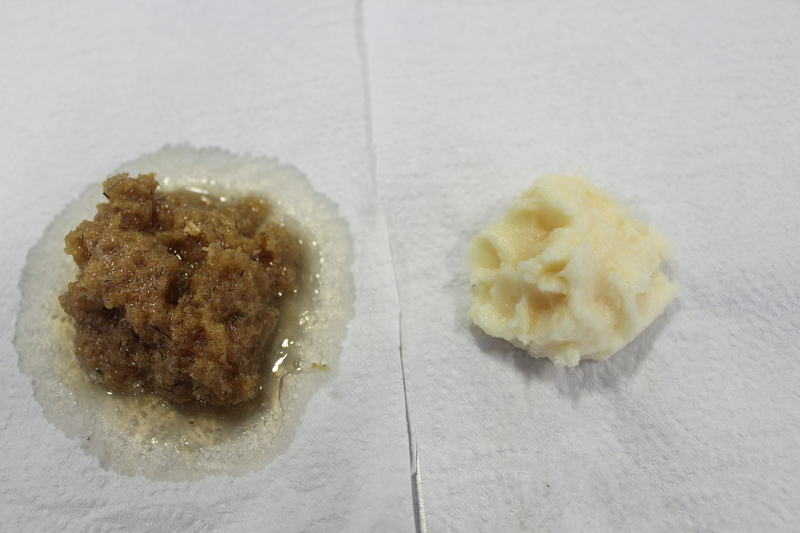 On the right is Epoxy mixed with 406 Colloidal Silica Filler to the same consistency. Notice the puddle of epoxy draining out of the epoxy/sanding dust mixture. An exception to this is our G/5 Five-Minute Adhesive. It is more viscous to begin with, and remains liquid for only about five minutes, which is not enough time for the epoxy to drain out of the added wood dust fibers. With products like 105 Epoxy Resin and 205 Fast Hardener, a more reliable way to thicken epoxy is to add 406 Colloidal Silica. The particles interact with the epoxy rather than absorb it, thus increasing the viscosity of the epoxy. Then a very fine sanding dust or wood flour could be added to tint the mixture if needed. While adding extra catalyst to polyester resins can lead to faster cure, it doesn’t work to add extra hardener to epoxy. Epoxy reaches cure when the resin molecules crosslink with hardener molecules. When there is too much of either resin or hardener, unlinked molecules are left, which can result in uncured epoxy or compromised cure strength. Always be sure to mix resin and hardener as close as you can to the recommended ratio. 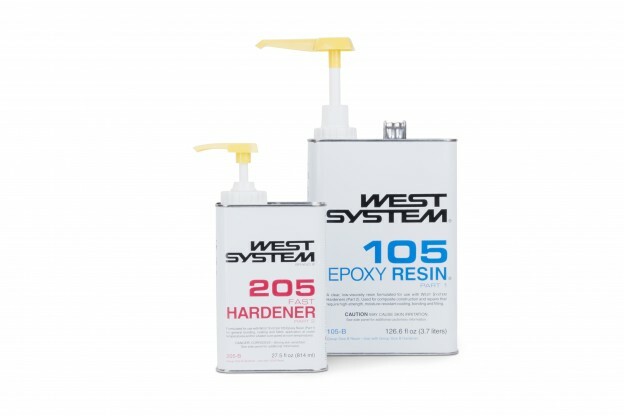 Unlike traditional wood glues, WEST SYSTEM Epoxy is stronger than wood. Because of this, it is beneficial to have some epoxy between the objects you are gluing together whether they are wood, fiberglass, or other materials. As long as the epoxy is contacting the entire surface of both substrates, no clamp pressure is needed. With epoxy, the goal clamping is to simply ensure the epoxy contacts the entire surface for the duration of the cure time. Moderating clamp force is all that is required. If filler is not used and a high clamp force is used, the result can be a glue-starved joint which will make failure much more likely. Glue starved joints are weaker than their counterparts. Avoid glue-starved joints by following the one- or two-step bonding method described in the WEST SYSTEM User Manual. While certain fillers will increase the density of epoxy, this does not correlate to higher physical properties or increased adhesion strength. Epoxy is strongest without filler added to it, but the fillers are necessary to increase the viscosity of the mix, bridge gaps, prevent the epoxy from soaking too far into the wood, and prevent glue-starved joints. Rot eats away the cellulose fiber in wood. Since cellulose is the structure of the wood, replacing it is not as simple as brushing on a coat of solvent-thinned epoxy. Solvented epoxy can restore some of the strength, but isn’t a permanent repair because it won’t restore the strength of the wood fibers. In order to make a permanent repair, the entire rotten area should be replaced with fresh wood and sealed with epoxy. Doing the repair in this manner will actually make the repair area stronger than it was before the rot occurred. Rot needs 4 major components in order to continue growing: food, moisture, oxygen and warmth. Cutting off one of these components is enough to cause the rot to go dormant. Solvented epoxies are supposed to cut off rot’s food source by encapsulating and contaminating the wood that the rot spores consume. The remaining three components: moisture, oxygen, and warmth, can still penetrate wood coated with solvented epoxy. This is because solvented epoxy is a poor moisture barrier. Rot spores will remain in the wood, and even when encapsulated in solvented epoxy they will only go dormant. The spores that are not isolated will continue to devour the cellulose and “rot” the wood. This is why we recommend removing the rotten wood and replacing it with fresh, rot-free wood that is sealed with several coats of WEST SYSTEM Epoxy.